Royal Pains and Angels in the Outhouse is a children’s adventure story by author Gregory Saur. Centering on all the fun of the sport of baseball, the tale focuses on the locale of Hills Brook County, where it’s every young boy’s dream to play for the Royals. However, there are rebels in the county determined to take the Royals down, creating their own team called the Angels. Tyler Hendricks is at the head of this rag-tag crowd, leading a seriously underdog team through a series of amusing disasters as they continue to believe that they can out-do the best team around. For sports fans young and old, Gregory Saur has certainly created a fun and frolicking adventure full of twists and turns. There are several small errors which may irk some readers, but the overall tale is told with great heart and attitude. It’s clear the author has plenty of inside knowledge and a real passion for the sport, instilling that passion in the hearts of his young characters. I think it would certainly be a great family read and, although the plot sometimes takes a far-fetched turn, everything is in good fun and if you take the story in that spirit, it really works. All the exterior trappings of the life of rebellious young boys bring them into living colour, and even the lowliest losers become lovable friends to follow. Overall, I’d certainly recommend Royal Pains and Angels in the Outhouse to young male readers and sports fans alike. 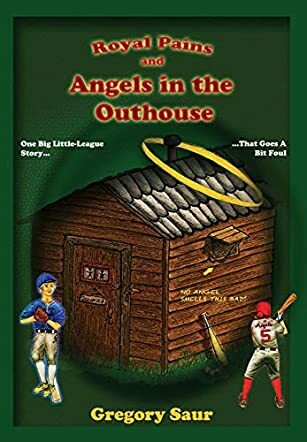 Royal Pains and Angels in the Outhouse will entertain young people for hours as Gregory Saur exposes the antics behind Little League Baseball. We enter the home lives of three of the angel players and find the imperfections that drive them to baseball. Taylor is a preacher's kid who is at that age when he realizes that not everyone loves his father and his trust falters a bit. Jose just moved from Arizona and finds his home life in a shambles - he relies on baseball as a balance in his world. Then there is Tyler, who is the glue that brings them all together. You have to love this guy as he sticks up for the unloved, unwanted, and uncoordinated kids. His creativity is humorous and inventive. I found Royal Pains and Angels in the Outhouse extremely funny as only kids eleven and twelve can be. Gregory Saur obviously loves kids this age to show their true nature without alteration. Saur does not hold back the pressures these kids face in this small town. His characters are confronted with bullying, shame, and anger, but the author shows how all of these can be handled within a fun novel. Tyler is used often to show how to make and treat friends, which can be lacking at this awkward age. This book also stresses the importance of team work, which is the key element in winning. Overall, I would recommend this hilarious novel to junior high kids and especially those who love sports. This is a longer book, but it draws the reader into these kids' lives, making it impossible to put down until the season ends. The ending is sweet as these misfits bond into a force to be reckoned with.